The Wizard of College Baseball, at the unveiling ceremony on April 24, 2015. The monument to “The Wizard of College Baseball,” who led the Hurricanes for 30 years from 1963-92, was created in clay by world-renowned, Philadelphia-based sculptor Zenos Frudakis and cast in bronze at the Laran Bronze Foundry in Chester, Pa. The statue was majorly funded by friends and fans of the late Coach Fraser and was completed within a year. Coach Ron Fraser, who passed away in 2013, was one of the most successful coaches in NCAA baseball history, and was responsible for bringing college baseball to a new level of public awareness. While never posting a losing season, Fraser’s teams won 1,271 games and captured the 1982 and 1985 national titles. 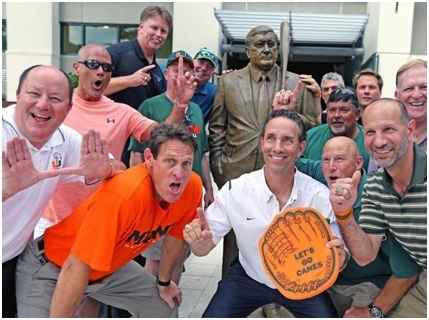 From ESPN covering games in Miami to his "Dinner on the Diamond," from creating the batgirls with "The Sugarcanes" to developing a mascot, The Miami Maniac, Fraser made Mark Light Stadium the premier family entertainment spot in South Florida. More than a hundred of Fraser's ballplayers went on to professional baseball and many more started successful careers. Fraser was inducted into the College Baseball Hall of Fame in its introductory Class of 2006.